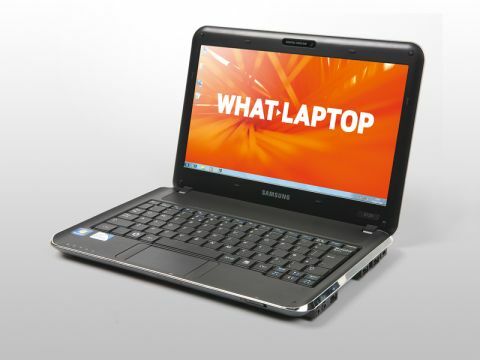 The Samsung X120is a small, stylish and very usable ultraportable laptop that is worth a look if you're after a well-priced machine to keep you productive on the move. The glossy 11.6-inch screen is bright and detailed, so you'll have no problems viewing all manner of data, from pictures to spreadsheets. The viewing angle is also good, making the screen simple to read from all angles. The shiny Super-TFT screen coating creates distracting reflections when viewed in bright conditions, however. The chassis is built from hard black plastic, providing good protection for the laptop's internal components and an attractive silver stripe runs round the edge of the chassis. The lid boasts a shiny silver finish, although it manages to avoid attracting many fingerprints and smears. Despite the compact chassis, the keyboard is large. There's a little flex, but it provides a comfortable typing experience. A large speaker sits at the top of the keyboard forcing the keyboard itself down. This means the palmrest is very small and often forces your hands to rest on the surface the machine is sitting on. The touchpad is responsive, but the mouse buttons are positioned on either side, rather than underneath it. This makes successfully operating the touchpad and buttons with one hand almost impossible, which may irritate some. The Consumer Ultra Low Voltage (CULV) Intel processor is combined with 3072MB of memory and provides sufficient performance for office applications and you'll have no problem surfing the web and creating spreadsheets. This isn't a multimedia laptop, however, and the integrated Intel graphics card ensures that 3D performance is limited to basic photo editing, with all but the simplest of games out of the question. Portability is generally great and the compact 1.4kg chassis is no trouble to carry around. Battery life, at 199 minutes, is decent enough and, while it won't provide all-day computing, you'll have plenty of power for the commute. It's worth noting that there's no built-in optical drive, so you'll need to buy an external drive to read and write CDs and DVDs. Wireless networking is courtesy of high-speed 802.11n Wi-Fi, with basic 10/100 Ethernet providing wired networking capabilities. There are three USB ports for attaching peripherals and also VGA and HDMI ports for hooking up to analogue and digital external screens and projectors. If you're after a well-priced ultraportable there are now more options than ever on the market, but thanks to its great design and good portability, we'd be very tempted by the Samsung X120.